interwiki wikilinks don't have their class="extiw" either and hence are blue rather than light blue. This can cause unwanted dofollow links (links without nofollow) against our policies (see T54617: Respect $wgNoFollowLinks and $wgNoFollowDomainExceptions and T68289: A16. Flow: external links should have rel="nofollow" property), as well as a style inconsistency for interwiki links. Note, when we convert to RESTBase (T94574: Switch Flow from ExternalStore to RESTBase) there will probably have to be (and if not, could be) a one-time reconversion of all our Parsoid HTML. Also, at that point, there may be a standard process for updating HTML should the Parsoid rendering change for things like this. Nemo_bis added a project: StructuredDiscussions. 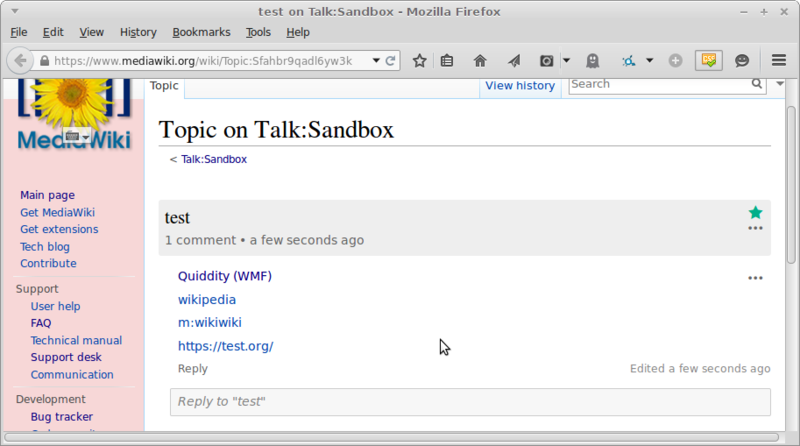 Nemo_bis added a parent task: T92303: Convert LQT pages on MediaWiki.org to Flow (tracking). External inks display the icon in betalabs. DannyH moved this task from Product Review to Done on the Collaboration-Team-Sprint-A-2015-05-06 board.